The Salem Witch trials, which took the lives of twenty people, most of them women, are one of the clearest recorded instances of “the dangers of isolationism, religious extremism, false accusations and lapses in due process” (Adam, 2009). As a cautionary tale of events taking place at the dawn of what would come to be known for America as, The Age of Enlightenment, the Salem trials stand as a stark reminder of our recessive reactionism to anything new, different, or suggestive of change. Moreover, that’s the point. 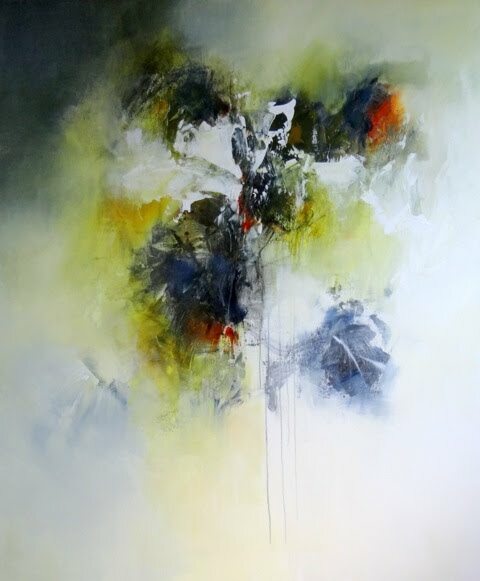 We are now poised, once again, at the edge of another approaching period of tumultuous change; every time that happens the behavioral patterns of the past surface in a slightly mutated form. Who will be “the witches” this time? Scientists? Coders? The machines themselves? The web of information that used to be of value like a library of sorts, thanks to semantic technologies, it is being transformed quickly into something entirely different. It is becoming a knowledge layer that’s being applied to our non-computer world, which is being informed by the web, and is informing it in turn, in a complex dance of contextual knowledge that is thrilling and alarming at the same time. Powering all of this transformation is a new reliance on mathematical algorithms that sift information, unprecedented in scale, to the point that it may already be true that, “Algorithms are taking over the world,” (Steiner, 2013). There is a dichotomy at work here; as we rely more and more on machines to do the heavy lifting, doing all the things we can’t do ourselves, we also flock in droves to social networks looking––not for heavy mental lifting––but for the human connection, for contact, meaning, and play (Project, 2013). It is in that human connection that “scale” begins makes the most sense. It is in the human connection that algorithms, paradoxically, acquire real personal value. Algorithms––well done––can help us find like-minded souls faster than any possible analog human experience. 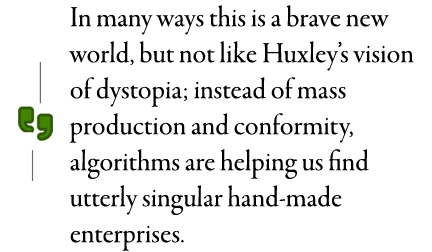 In many ways this is a brave new world, but not like Huxley’s vision of dystopia; instead of mass production and conformity, algorithms are helping us find utterly singular hand-made enterprises. We are in the realm where data has been tamed, sentiment can be mined, the chaotic nature of the world revealed, and then, reorganized into something new. Making all of this possible is a sense that we are not alone, that we have a place in a world where even though our constructs have the potential to run amok, that we can rely upon our human digital connections, near and far, to provide more brainpower––and better, more original, human conversations––than we can ever find on our own. The sense that we are about to enter the machine age where algorithms invisibly do a lot of the thinking work for us is making us (or at least this author) uneasy. In this new global village (McLuhan, 1964) where the medium and the message form an inseparable entity, the risks are guided by human responses and––more important to the point of this essay––human weaknesses. We may resort to our weaknesses, to the witch-hunt response, and band together to condemn anything and anyone who challenges our preconceptions about online relationships and digital power, lashing out at the change that’s coming by forming divisive cabals. Alternatively, we can recognize our worst instincts early enough to tame them and allow cooperation with machines (and each other) to take place. 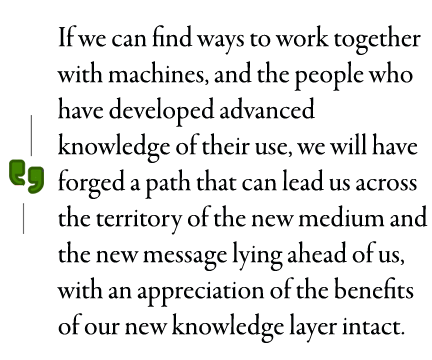 If we can find ways to work together with machines, and the people who have developed advanced knowledge of their use, we will have forged a path that can lead us across the territory of the new medium and the new message lying ahead of us, with an appreciation of the benefits of our new knowledge layer intact. Should we fail to do so, should we again lash out at what we do not immediately understand, we will look back at ourselves someday as having wasted great potential, to the harm––maybe physical and certainly mental––of our fellow beings. Nevertheless, if we succeed in creating an intellectual environment akin to the Enlightenment, but this time much more open to working toward a global understanding of the freedom the digital connections our new machines give us, I think we will usher in an age whose potential and promise for personal fulfillment can hardly be imagined. The key here is to move forward because of our humanity, not in spite of it. David Amerland’s involvement with the Web goes back to the days when the number of websites in existence could fit in a printed 80-page directory and SEO consisted of keyword stuffing and pixel-wide hidden text. Since those less enlightened days he has worked with blue-chip multinationals and individual entrepreneurs alike helping them craft SEO and social media marketing strategies that work with their internal cultures and deliver value to their target audience.